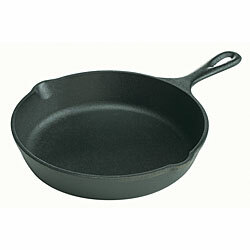 For heavy pans like cast-iron skillets there is an easier way to lift them than the way you usually lift pans. If you try to lift the pan with your palm facing the pan and your fingers toward the end of the hand, it puts less stress on your wrist. For someone small like me, this makes even heavy pans easier to lift. So you don't have to be strong to use that cast-iron skillet you've been hiding in the back of your cabinet.